Is The Tunisian Government Hacking Facebook Accounts? The government of Tunisia may have chosen an odd way to combat protesters: Hacking into their Facebook accounts. This appears to have gotten the attention of the hacker group Anonymous, which is siding with the protests. Based on reports of users in the country, Tunisian authorities appear to be modifying web pages on the fly to steal usernames and passwords for sites such as Facebook, Google and Yahoo. Unknown parties have subsequently logged onto these sites using these stolen credentials, and used them to delete Facebook groups, pages, and accounts, including Facebook pages administrated by Sofiene Chourabi, a reporter with Al-Tariq al-Jadid, and the account of local online video journalist Haythem El Mekki. Local bloggers have told CPJ that their accounts and pictures of recent protests have been deleted or otherwise compromised. The likelihood that a group of criminals compromised the entire Tunisian infrastructure is virtually nonexistent. Code planting on this scale could only originate form an ISP. With their history of holding an iron grip on the Internet, ATI is the logical source of the information harvesting. 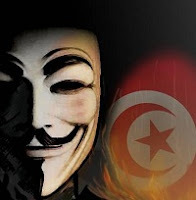 So the hacker group Anonymous has sided with the protestors and has been attempting to make distributed denial of service attacks against the Tunisian government. While this involvement is growing, Tunisia state control over Internet access makes trickier targets out of sites in the country. Anonymous has been releasing browser add-ons to help Tunisian citizens get around the local government’s alleged efforts to hack into individuals’ Facbook accounts. This has turned into somewhat of a cat-and-mouse game, as the state continues to one-up the hackers siding with the protesters and vice versa. We’re more generally concerned about the bad example potentially being made here, if in fact the hacking of Facebook accounts in Tunisia originates in that nation’s government. Surely other countries that censor online communications are watching the Tunisian situation closely. What if other parts of the world take a cue from this?